Yesterday the finches did not care that the weather was pretty foul ~~ LOL! They were out there letting us know that it was going to rain all day. (When birds eat consistantly through the rain, that lets us know the rain will last on and on. If it is raining, and there are no birds eating, they are predicting that the rain will let up later on, with enough day light hours to fill their bellies for night.) 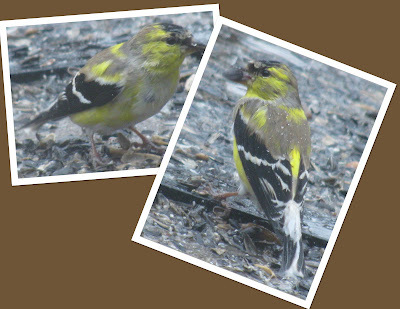 I was happy and surprised by how quickly some of the Goldfinch were molting into their breeding plumage. Here in middle Tennessee, we have the American Goldfinch all year long - just wearing different plumage in different seasons. Today we will be continuing on to the Nashville store for the Bluebird Seminar. Hopefully, this one will go as well as yesterday's two.